"The song that is irresistible"
We all know where that leads, don’t we? We think we’ll just swatch a little. We’ll test the yarn. We might as well choose the needles while we’re at it. We leap overboard. It’s so seductive, this geometry of lace. 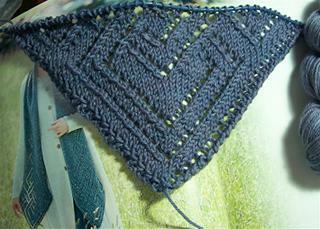 With each row the pattern builds, twines, and wraps its little tendrils around my knitting fingers. I am caught. Completely ensnared. I tell myself that I won’t forget the mostly-finished sock, that I promise to knit a few rows at work. If I can knit just a bit more on this scarf, just to see what happens next, I promise I’ll be good, I swear I’ll get up and switch the laundry, brush the cat, call the sister. I am so weak. I’m going back to knitting now. Jane, the scarf is gorgeous! I’m so glad you like the yarn! Oh Jane, that is a great lace pattern for a scarf. Mmmmmm, maybe I’ll have to get that pattern and put it with all my other “eventually” patterns!